We invite everyone to attend our online webinar events to become more familiar with the IIBA® Certification Program. This is a free online chat session with one of our CBAP® recipients. The CBAP mentor will tell you of their journey to become IIBA® Certified, provide tips & tricks on anything related to IIBA Certification from the application process to re-certification. Anyone interested in ECBA™, CCBA® or CBAP® certification is welcome to come and ask questions of our CBAP mentor. Bill Powers, CBAP works as a Business Analyst in the Enterprise Business Consulting Group at Republic Bank & Trust. He has several years of experience in Business Analysis, Project Management, Client Service Management, Operations and Benefit Administration. Bill has experience in Data Analytics, Operation Efficiency, Project Implementation, UAT and QA testing efforts. Bill has worked at Kindred Healthcare, Humana and ADP prior to joining Republic Bank & Trust. 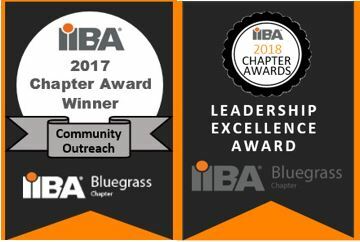 Bill is the newest Certified Business Analysis Professional™ (CBAP®) in the Bluegrass IIBA Chapter. Having recently passed the CBAP exam, he can provide very current information on the application process, exam and overall experience. Bill participated in the 2018 BABOK v3 Study Group provided by Bluegrass IIBA Chapter, participated in CBAP Preparation Bootcamp class provided by The Solarity Group, and passed the CBAP exam on Saturday, October 27, 2018. Bill is Director of Kentuckiana Branch and you can connect with him at Kentuckiana IIBA Branch meetings or on LinkedIn.